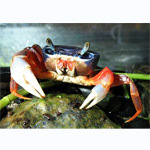 Since this is primarily a "land crab" it should be given access to a land area in the aquarium. It is not well suited to life underwater and will definitely try to climb out if you don t provide it with somewhere to sit above the water level. Most crabs are opportunists, and this one is no exception it seems. It accepts most foods, almost anything, in fact, but also has a tendency to try and eat fish. It wouldn t be wise to house it alongside fish. What it can t catch it could injure with its hefty, sharp pincers. Breeding is very difficult especially with rainbow crabs, breeders often find them hard to breed. The males however have a long "flap" of skin that goes across the belly that reaches to a point on the bottom. The females have a much wider flap of skin that instead of making a point, is more squared at the bottom. Several can be kept together but they can be aggressive and rather territorial, so provide plenty of shelter in the form of bogwood and rocks, and do keep an eye out for any crabs suffering from bullying by dominant males.